The bold and colorful title and cover caught my eye at the library. I wasn’t sure I wanted to read another depressing memoir about homelessness, but since it took place in Boston, a city I’m quite familiar with, I decided to give it a go. There were some darkly humorous moments, as I’d expected from the title. 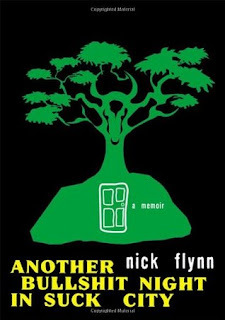 Overall, this was a poignant, honest, and intense story about Nick Flynn’s relationship with his absent, alcoholic, and delusional father. I learned after I started reading the book that Nick Flynn is a poet. This must explain his writing style, random scenes, and frequent jumping back and forth in time. It took me nearly half the book to warm up to Flynn’s style and start really caring about the characters. There are lots of exquisite and evocative passages and inventive turns of phrase that I know will stay with me long after I return the book to the library, and I wish I could love this story more than I did. I wonder if it was the author’s style that made me feel distanced from the characters and kept me from empathizing with their situation until much later in the story. Still, this unusual memoir is definitely worth reading.